Shallow Obsessions About Fashion: I'm back and you can call me "Mrs" now! I'm back and you can call me "Mrs" now! After a month's vacation its soo hard to get back into the grind of life! 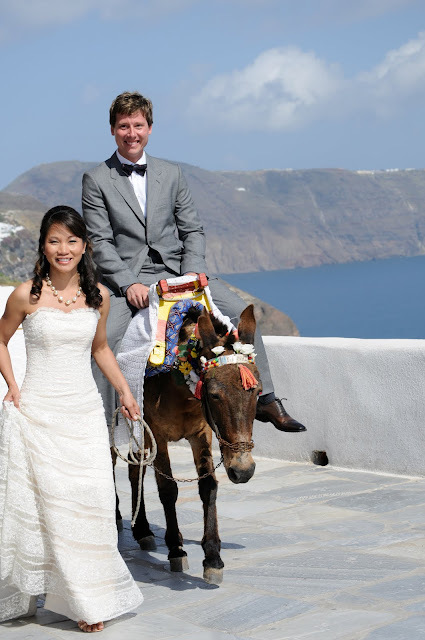 I just wanted to share some snaps of from our nuptials in Oia, Santorini. We were blessed with the miracle of perfect weather and I'm still amazed at how our day went way better than we ever dreamed of. Stylewise, the dress was a basic Maggie Sottero that I modified. What were the changes? - gathering the extra top layer in the back for a perma-bustled fishtail. And the final result? Tada! Something blue - Either the clutch or the Aegean Sea. Take your pick! As for the groom.. he wore a suit by Acne, which required barely any tailoring. Etam shirt. Top Shop Man polka dot suspenders. Shoes from Holt Renfrew. And a paisley bowtie endearingly created by his mama. Lets just say we broke Greek Tradition with our stunt.